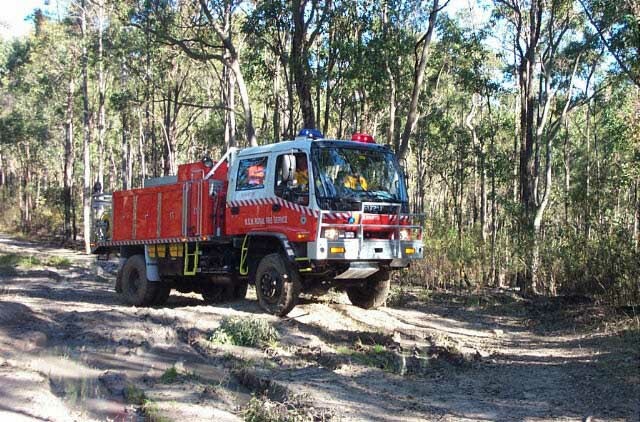 This page is dedicated to the ladies and gents of our local RFS units. These people give up many hours to protect our properties and bushland. They are often called upon to be away from their families at the most important times such as Christmas. 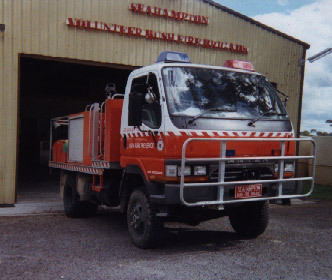 The Rural Fire Service has gone through many changes over the past few years, they now have better vehicles and the volunteers have a lot more training to undertake. We would like to thank them for their service to the community. In our area, the RFS uses both GRN and standard frequencies for their communications; The GRN talk groups are below, with standard frequencies being further down the page. It appears that the northern section of The Lakes; (ie, the Lake Macquarie section) has moved across to the PMR network and off GRN. The GRN allocation has been quiet all weekend. These photos show units from Seahampton (Lake Macquarie). They show the Cat 1 and Cat 7 appliances (see below for the Cat. descriptions). And,, I must say hello to Alistair & the great crew at Seahampton, KEEP up the good work! The above frequencies are allocated to be used throughout the state, try scanning these during major fires for activity. Category 1 Heavy Fire Appliance AWD 3,001 L. - 4,000 L.
Category 2 Medium Fire Appliance AWD 1,601 L - 3,000 L.
Category 3 Heavy Fire Appliance 3,001 L. - 4,000 L.
Category 7 Light Fire Appliance AWD 801 L. - 1,600 L.
Category 8 Light Fire Appliance 801 L. - 1,600 L.
Category 9 Mop Up Fire Appliance AWD 350 L. - 800 L.
Also used are units known as "slip-on", "trailer", "carrier", "support", "canteen", "boat", etc.